Yahoo is front and center in tech news this week, but not because of its services. Last Friday, the company told its employees that as of June 1st, no one will be permitted to work from home. 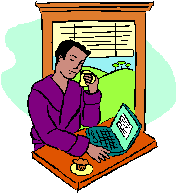 The internal memo cited quality and efficiency concerns related to telecommuting. The change has angered some employees and sparked criticism. In other interesting news, today is Pope Benedict XVI's last day in office, and cardinals will soon meet in conclave to elect a new pope. Though technological advances such as Twitter and camera phones make secrecy a difficult goal to obtain, the Catholic Church is taking every precaution. Cardinals are forbidden to engage in any communication with the outside world (including tweets) while in conclave, and other staff present for the deliberations face excommunication if they are caught using any device with recording technologies (i.e., almost any phone these days).